The days are noticeably shorter than they were at the beginning of summer and the back-to-school ads are coming in full force. This week’s outfit is something that you could wear to enjoy the last few weeks (or days, depending) before school, and would also be appropriate to wear to class when you want to remember back to the carefree days before homework. I kept it simple in terms of accessories and stuff. In other words: I had none. I wanted something comfy and sweet, like you’d find on that girl with the glasses who writes in the corner of the coffee shop (basically, me). It’s the end of summer and I have no one to impress but myself so I’ll put on some lip balm and I’m good to go. Do whatever makes you happy. 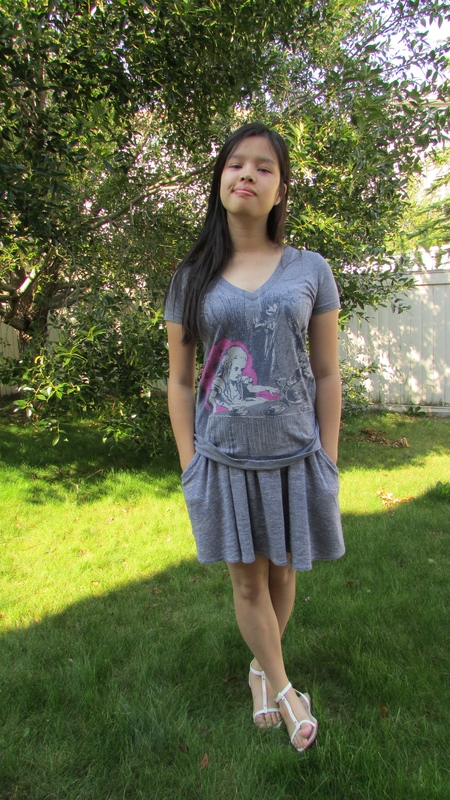 The t-shirt has a picture from the Alice in Wonderland books which I’ve read. I prefer to wear t-shirts with references and logos from things I’ve actually read or seen. It gives things more meaning, plus if anyone comments on it, I’ll be able to keep up. This shirt I got from Out Of Print, but I’ll warn you: I’ve ordered from them twice and both times the order was messed up somehow, once royally. The skirt is from Aritzia, and look! Pockets! It’s a bit difficult to tell in the picture, but it’s a lavender colour which sets itself apart from the grey t-shirt without distracting from it. Last but not least, I got the beautiful white sandals from Zara. I won’t have many more chances to wear sandals this year and they give the whole outfit a bit of a summery lift. So what do you think? What do you love? What would you change? Tell me below!